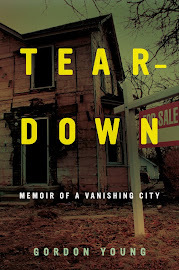 Teardown: Memoir of a Vanishing City by Gordon Young will hit bookstores in June 2013. It's available now for pre-order. Go to teardownbook.com for photos, excerpts, reviews, links to online stores like Barnes & Noble, and more. At the height of the real estate bubble, Gordon Young and his girlfriend buy a tiny house in their dream city, San Francisco. They’re part of a larger influx of creative types moving to urban centers, drawn by the promise of fulfilling jobs, bars that offer a dizzying selection of artisanal bourbons, and the satisfaction that comes from thinking you’re in a place where important things are happening. But even as Young finds a home in a city sometimes described as 49 square miles surrounded on all sides by reality, a vital part of him still resides in industrial America in the town where he was raised: Flint, Michigan. It’s the birthplace of General Motors, “star” of the Michael Moore documentary Roger & Me, and a place that supplies the national media with never-ending fodder for “worst-of” lists. Filled with nostalgia and compelled to help his struggling hometown, Young hatches a plan to buy a house in Flint. He embarks on a tragi-comic odyssey to rediscover the city that once supplied the country with shiny Buicks and boasted one of the highest per capita income levels in the world, but now endures a real unemployment rate pushing 40 percent. What he finds is a place of stark contrasts and dramatic stories, where an exotic dancer can afford a lavish mansion, and speculators snap up cheap houses on eBay by the dozen like jelly donuts. There are desolate blocks where only a single house is occupied, and survivors brandish shotguns and monitor police scanners. While the population plummets, the murder rate soars. Throw in an arson spree and a racially motivated serial killer and Young wonders if Flint can be saved. And yet, he discovers glimmers of hope. He befriends a rag-tag collection of urban homesteaders and die-hard residents who refuse to give up on the city. Dave Starr, a well-armed shop rat who logged 14,647 days in a G.M. plant, battles cancer and economic decline as he joins forces with his neighbors to preserve a lone block surrounded by decay. Pastor Sherman McCathern negotiates with God in his heroic effort to transform an abandoned church and improve the lives of his congregation. Mayor Dayne Walling, a Rhodes Scholar in his thirties who spent his adult life grooming himself to run Flint, has the toughest job in politics — one that sometimes necessitates police protection for his family. And Dan Kildee, a local politician and urban planning visionary, grabs international attention — and trades jabs with Rush Limbaugh — by arguing that Flint and other troubled urban areas should manage decline instead of futilely trying to stop it. Young’s insights, hard-hitting and often painfully funny, yield lessons for cities all over the world. He reminds us that communities are ultimately defined by people, not politics or economics. Teardown reveals that the residents of Flint are still fighting, in spite of overwhelming odds, to reinvent their city. In the end, Young learns that you can go home again. But the journey is likely to be far more agonizing and rewarding than you ever imagined. There must be a thousand good reasons to flee Flint. I can't assume there are many reasons to return. Gordon Young's Teardown supplies a few of these answers. A humorous, heartfelt and often haunting tale of a town not many could love. Fortunately for us, a few still do. Teardown is the tragic and somehow hilarious tale of one man's attempt to return to his hometown of Flint, Michigan. Gordon Young is a Flintoid at heart, and his candid observations about both the shrinking city and his own economic woes read heartbreakingly true. Teardown is a funny and ultimately heartbreaking memoir. The travails of house hunting are skillfully interwoven with Gordon Young's attempt to reconcile life in his adopted city of San Francisco with his allegiance to Flint, Michigan, the troubled city of his childhood. The result is an all too contemporary American story of loyalty, loss, and finding your way home. Like so many other Flintites, I visit my hometown with a mix of sadness, repugnance, and anger. Flint is too easy to criticize, but I look back in gratitude for the values Flint instilled and the bonds I made that remain with me to this day. You can take the boy out of Flint, but you can't take Flint out of the boy. - Howard Bragman, author of Where's My Fifteen Minutes? Looking forward to reading it. You have done a great job with this blog. 20 "Likes" as of today on Amazon. Can't wait! And I love your new banner. > And I love your new banner. Me, too. It's most excellent. Gordon, this is a little off topic, but can you tell me how to get a book on to Amazon for pre-order? I've searched all over Createspace, but can't find anything. All of the instructions seem to assume that you've got the book ready to publish and can just upload it. Do you have a publisher who did this for you? I'm asking because I'm on the verge of publishing a book on space policy, and I'd sure like to take some advance sales. Anyway, congrats -- looks like a great book. Believe it or not, Don Williamson granted me a rare extended interview (two hours!) in the summer of 2009, including a tour of the dealership and an invitation to visit him at his mansion off Miller Road. I wasn't able to use any of the material in my Slate story on the special election or the book, but he was nothing but nice to me. I was surprised because I'd heard he, well, doesn't typically play nice with the media. So I'm game...not sure the book publishers would be, though. Patsy Lou (and AFAIK Don) are in the process of selling their dealership to their sales manager, per an article I saw in a recent suburban newspaper. My assumption is that they're retiring. Amazon has been all over the place in the past month, first announcing a delayed expected date of publication, then an advanced one. They informed me today that my copy has shipped. That sort of implies that the date of publication is here. Yay.